I need some information on brain pacemakers and rare forms of hospital-administered procedures easily classified as, "biohacks". I have severe epilepsy and I already have an ambulatory EEG permanently hooked up to me modified to act as a monitoring system but firstly they're upgrading it to use electrodes implanted directly in my brain in tandem with Vagus Nerve Stimulation (a brain pacemaker) for medical reasons. Does anyone here have experience with rare and invasive brain implants rarely implemented on humans? These implants would under no circumstances be accessible to standard body-modders and are state-of-the-art pieces of unfathomably expensive medical hardware so any information would be appreciated. I asked the doctors but the specific implants are 2 months old meaning any possible risks from the nuances of the hardware cannot be predicted until I'm hooked up in a few months. Also for those curious, brain pacemakers allow one to adjust the pulses sent by the device so I would have, at least in this one medical instance, have complete control over my VNS system. No I don't know if that's dangerous but a team of neurologists thought of it and prescribed it so I'm fairly trusting. Also no, I have absolutely no implants I got willingly. Everything I have essentially serves as portable life-support so I have a lot of experience with medical implants. I took the liberty to remove the double post in the site suggestion category. My personal experience with the devices you mention is very limited. They usually perform the desired function very well. Minor changes in the hardware design won't change the fact that they will "only" generate a certain current/voltage waveform on the electrodes. So generally speaking the circuit driving the actual electrodes and the effects of it are not the point to worry about. I do know that most permanently implanted pacemakers (heart, spinal cord, brain) do have interfaces to access and configure the devices. A few years back those were primarily close proximity interfaces which also allowed charging of the device. Modern devices tend to have longer range interfaces too for diagnostic purpose. Like sending statistics and observed anomalies to the company building the device or your doctors for analysis. There also have been a couple of infamous devices showing a severe lack of security. Like securing the device-basestation communication with very weak encryption (21bit iirc), or having master keys which allowed firmware upgrades without any questions asked. 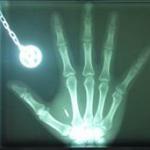 So, do you have actual questions concerning your future implant? If so can you provide the device specs/model? My experience with brain implants was during my elective seeing a kid patient who was admitted because his deep brain stimulation electrode was infected . He had it to control his movement disorder and there was a lot of discussion in between the doctors (from around the world, in fact!) as to the merits and cons of taking it out. So yeah, not a positive experience for brain implants.